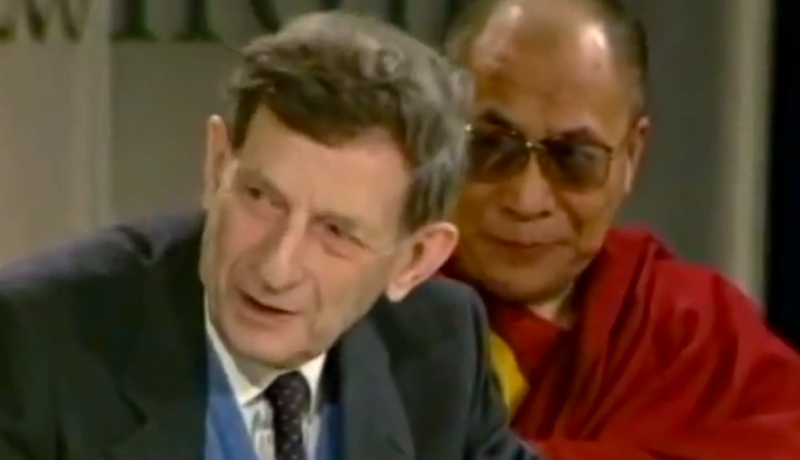 The following is a transcript for the video “Wholeness & Fragmentation,” a short excerpt from David Bohm’s presentation in Amsterdam, in 1990, as featured in the documentary Art Meets Science & Spirituality in a Changing Economy. “We are internally related to everything, not [just] externally related. Consciousness is an internal relationship to the whole, we take in the whole, and we act toward the whole. Whatever we have taken in determines basically what we are. I think the difficulty is this fragmentation, first of all. Everybody, all thought is broken up into bits. Like this nation, this country, this industry, this profession and so on… And they can’t meet. It’s extremely hard to break into that. But that comes about primarily because thought has developed traditionally in a way such that it claims not to be effecting anything but just telling you “the way things are.” Therefore, people cannot see that they are creating a problem and then apparently trying to solve it. Let’s take a problem like pollution, or the ecology. See, the ecology in itself is not a problem. It works perfectly well by itself. Its due to us, right? It’s a problem because we are thinking in certain ways by breaking it up and each person is doing his own thing. Therefore the ecological problem is due to thought, right? But thought thinks it’s a problem out there and I must solve it. That doesn’t make sense because simultaneously thought is doing all the things which make the problem and then tries to do another set of activities to try and overcome it. See, it doesn’t stop doing the things which are making the ecological problem, or the national problem, or whatever the problem is. Now, the implicate order would help us to see that, to see everything enfolds, everybody, not merely depends on everybody, but actually everybody is everybody in a deeper sense. See, we are the earth because all our substance comes from the earth and goes back. I mean, its wrong to say its an environment, just surrounding us. That would be like the brain regarding the stomache as part of its environment. The word com-passion is to feel together, and if people have the same feeling together, they are responsible for each other, then you have compassion. I don’t think that there is such a thing as original sin. I think it has developed more and more with the growth of our society. There is no evidence that people in a hunter/gatherer society were all that competitive. But the more you made society big and you had organization, and you had to get to the top, and people on the bottom would suffer. There was a drive to compete, naturally. It’s not a weakness, it’s a mistake. So the first thing we have to do, in the long run, is to look at our way of thinking, which has developed over so many thousands of years. I don’t think it was the original way of thinking of the human race at all, but for many complex reasons it came about. Now, that means that people have to participate, to make a cooperative effort, to have a dialogue, a real dialogue, in which we will not merely exchange opinions, but actually listen deeply to the views of other people, without resistance. And we cannot do this if we hold to our own opinion and resist the other. It doesn’t mean we should accept the other, but we have to be able to look at all the opinions and suspend it, as it were, in front of us, without carrying them out, without supressing them. Wholeness is an attitude or an approach, but can be given a scientific realization, because of relativity and quantum theory, we can if we wish look on the world as a whole. Consciousness is really our most immediate experience of this implicate order. You may think of nets of consciousness that are finer and finer, or we may think of capturing finite aspects of the implicate order. I think there is an intelligence [in the Universe] that is implicit there, a kind of intelligence unfolds. The source of intelligence is not necessarily the brain, you see, but much more unfolding of the whole. Now, the question of whether or not you want to call it God, well, that depends on what you mean by the word. Taking it as a personal God might restrict it, in a way. I think science has begun to replace religion as the major source of the world view, and therefore, if science takes a fragmentary world view it will have a profound effect on consciousness. Science is whatever people make of it, science has changed over the ages and it is different now from a few hundred years ago, and it could be different again. There is no intrinsic reason why science must necessarily be about measurement. That is another historical development that has come about over the last few centuries. It is entirely contingent and not absolutely necessary. Einstein eventually moved toward a view of field theory where everything was one field, all fields merging, so it was a step toward wholeness. It was a limited step, but still it was the beginning. Wholeness is not a place you can get to, wholeness is a kind of attitude or approach to the whole of life. It’s a way. If we can have a coherent approach to reality then reality will respond coherently to us. But Nature has been tremendously affected by our way of thinking on the earth. Nature is now being destroyed. There is very little left on the earth which wasn’t affected by how we were thinking. This entry was posted in Uncategorized and tagged compartmentalization, connectedness, creative systems thinking, david bohm, new paradigm, wholeness, wisdom. Bookmark the permalink. Excellent, thanks for this. I’ve been very interested in Bohm’s visions and reading his books lately. This transcript is very valuable, actually that video is one of my all time favorites. Thought as as System was quite a book, by Bohm, for example. Bohm’s visions of open dialogue have really struck me, and am planning on implementing the inspiration that it gave, in some form. Also his talks and collaborations with Jiddu Krishnamurti are absolutely inspiring, as a side note. Great to see this wisdom spread, would love to be in contact with you. Thank you so much. I have not read Bohm yet, having so much going on now, but would love to learn more.